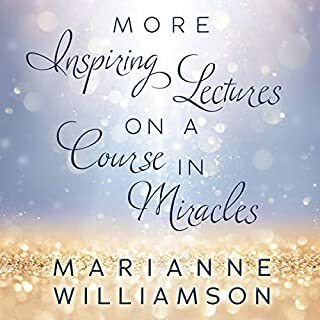 Williamson reveals how we each can become a miracle worker by accepting God and by the expression of love in our daily lives. Whether our psychic pain is in the area of relationships, career, or health, she shows us how love is a potent force, the key to inner peace, and how by practicing love we can make our own lives more fulfilling while creating a more peaceful and loving world for our children. 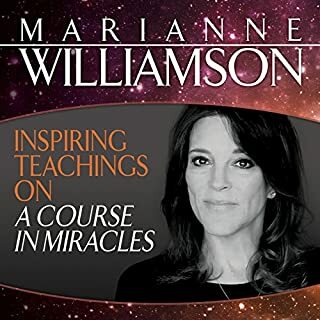 ©1992 Marianne Williamson (P)2004 HarperCollins Publishers, Inc. I easily digested this book in under 2 days and what can I say but WOW!!!! Marianne’s voice is so soothing yet penetrating, direct, with real conviction in every word she speaks. I’m so glad I purchased this book. If your looking for something that will truly change your perspective on everything - this is the book for you!!!! provided good information & insight that provided me with guidance & great peace. very grateful that I found this. I loved this book. 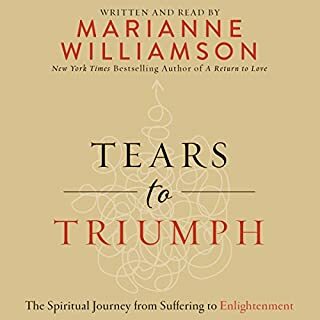 It hit so many chords with me..Marianne has a soothung voice and powerful messages. Highly recommend it. I've had a course in miracles sitting on my shelf for over a year and haven't been able to get my head around it. This makes everything so much clearer. 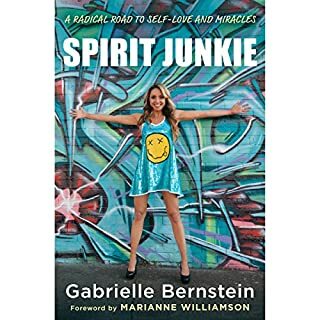 I had this book on tape years ago and still do along with most of her stuff but I have not had a tape player to listen to it on for along time.I just downloaded it to my IPOD and can not wait to hear it again. 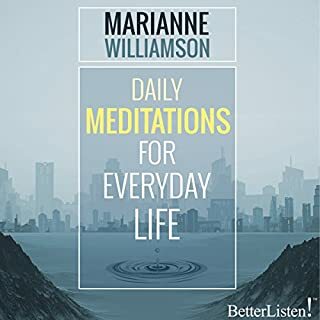 She has a perfect understanding of human nature and knows exactly the right things to say to help you, help yourself through almost any situation. 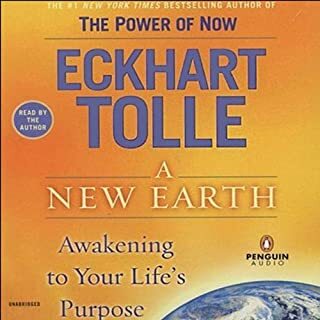 I would absolutely recommend this to any one who is looking for some spiritual guidance. 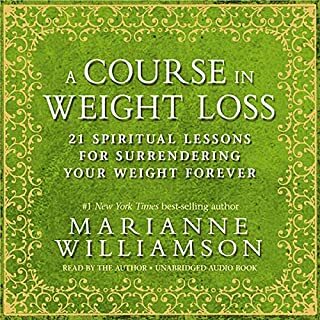 I have all her other audibles in my wish list! This book was suggested by my therapist. She warned that it might be too "religious" for me. I think this is the most impacting book I've read and I read a ton. It has sensitized me and awakened me like nothing else could. It changed my outlook entirely. . .and I've never said that before. It was a wonderful, human experience. I'm going to read it again and I can't even wait for the copy I lent to someone a couple of days ago!!!! 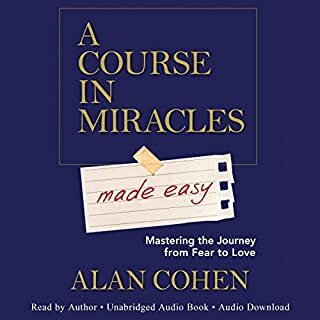 Explains "A Course in Miracles"
Introduced to A Course in Miracles by a group of AA members, I found it helpful but a bit of a challenge. This author provides a wonderful, practical, plain-english introduction that resurrected my interest in the more challenging text. By itself, "A Return To Love" is a nice piece of work for those who hear that quiet voice saying "something is out of tune." For me, it was. Williams helped me understand the problem and the solution in a way that enabled me to get better...much better. If you could sum up A Return to Love in three words, what would they be? What did you love best about A Return to Love? Simpleness of the story meant I could relate to it easily. What other book might you compare A Return to Love to and why? The book touched a cord in my heart and allowed the light at the end of the dark tunnel to shine a little brighter. 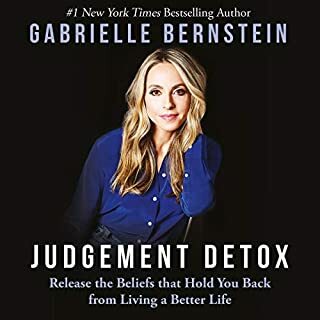 I'm not sure how I would have felt about this book if I had encountered it 5 years ago, but between then and now, I have worked with a personal coach and started my own personal growth journey. The journey has moved forward in an on-again, off-again fashion (mostly off!) but I know I have changed and grown in a positive direction. It all started when working with my coach, when with her prodding, I experienced a breakthrough insight. I have called that moment a miracle because within days, my relationship with my husband made a 180 degree turn from negative to positive. And it is still on that positive trend now, five years later. 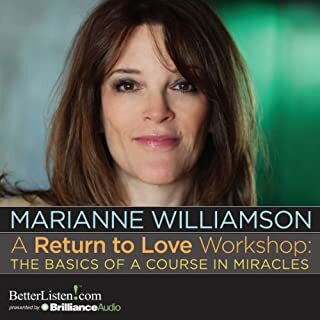 Listening to “A Return to Love,” I heard echoes of many of the things my coach was trying to tell me back then, but which I was not ready to hear. Now, it seems I am ready and many, many things in this book sparked recognition and understanding for me. 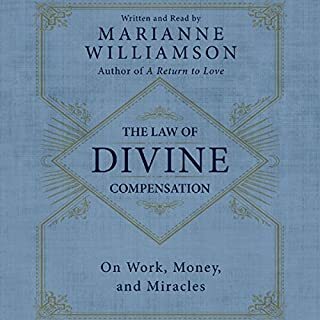 This book also created another miracle in my life. While reading it, I was suddenly moved to buy a plane ticket to visit a close friend. Without going into the details, I firmly believe that had I not made that impromptu visit, she would be dead right now. Not only that, but the concepts in the book are helping me know how to react to her situation in a healthy way that hopefully will contribute to her ability to heal herself. I thoroughly enjoyed this book. I've read the paper version of this book in different sessions at different points in time. Many parts more than once. 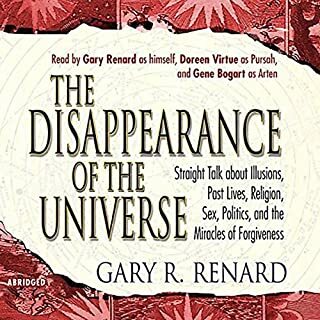 Listening to this, instead of reading it, I was able to pick up entirely different points than when I'd read it before. It was like reading a second version of the book I'd already read. 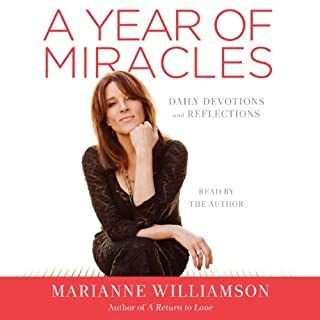 Marianne Williamson is one of my favorite spiritual leaders. I love her philosophy and her explanations. She is REALLY on to something. I highly recommend this book for something who is tired of trying to compare/compete with others and really just wants to live life to their OWN true potential. Amazing book, but very low volume. This book is unreal! 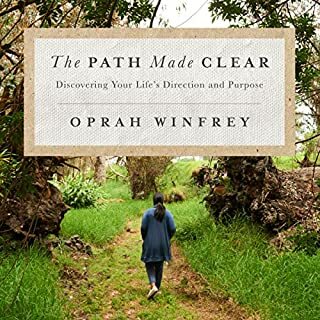 The book will literally change your life, you'll be rethinking things that you were so sure about, you'll be looking at things from a different angle. My only complaint is that Marianne talks very low and it was very hard to understand her. 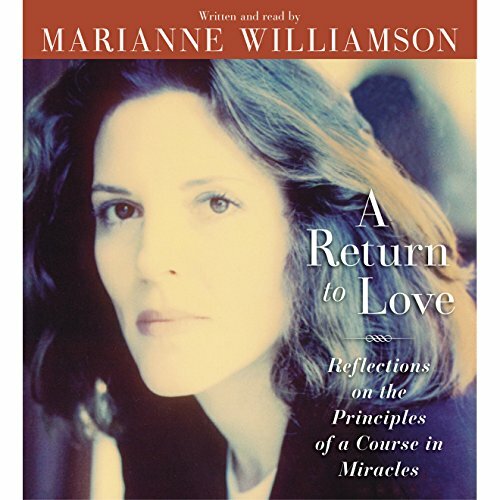 I absolutely loved this book and have now brought the course in a Return To Love. 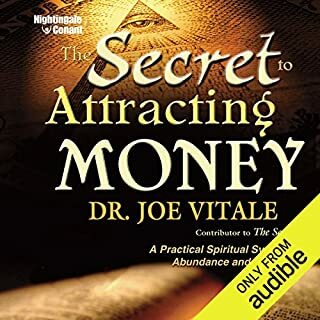 I have recommended this book to so many people. This is an incredible book with wonderful truth. I have to be honest though and say that the author reads her book far to fast and find myself almost out of breath listening. Marianne's voice is just amazing to listen to. With a strong opinion and admirable guidance, she is one who you want to listen to, hear what she has to say and change your thoughts based on her opinion. 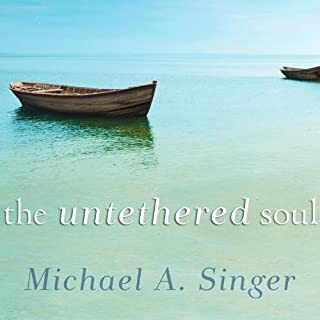 This book will open your eyes to the Spirit that is all around us and the God that is within us. 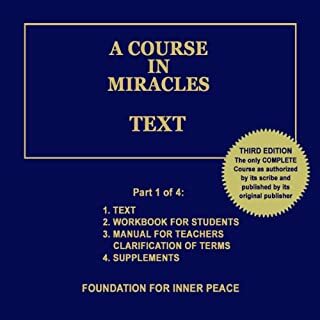 The Course in Miracles is a very long book. This book manages to condense it into a couple hours while making it feel like nothing is missing. Enjoyed it very much. <br />I absolutely love this book!